Ballistic results for the heavy pistol propellant show it appropriate for magnum pistol applications, .300 Blackout with lightweight projectiles and some other specialty ammunition. It is similar in burn speed to Accurate No 9®, and has similar application as Alliant 2400, Hodgdon H110 or Winchester 296. The superior ignition of this propellant permits less-than-full loading density. Therefore, it is not necessary to load “full power” loads with this propellant in order to achieve safe results. 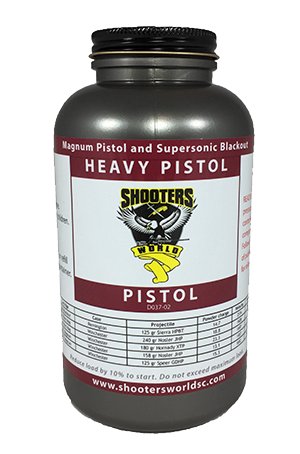 Shooters World tests this propellant with standard pistol primers, as well as magnum pistol primers. To date, we have found no evidence that Heavy Pistol requires a magnum primer for reliable ignition. In comparison to other magnum pistol propellants, we find Heavy Pistol exceptionally clean, accurate with either cast or jacketed projectiles, and exhibiting low muzzle flash. This propellant is a canister form of Lovex D037.2 reloading propellant. Ballistic load data using European CIP test methods and standards for D037.2 propellant is available here.